Behind the scenes National Cathedral Tour: Recommended for children 11 years old and older. 10:30 am and 1:30 pm most weekdays. $15 per person. Washington National Cathedral, Wisconsin and Massachusetts Avenues, NW. Monument Tour by Night: Lead by a National Park Service Ranger. 7:00 pm – 9:00 pm, Friday and Saturday. FREE. Tour begins at the World War II Memorial, 17th Street and Constitution Avenue, NW. For more information call 202-426-6841. Portrait Story Days – Jim Henson: listen to a story about the famous Muppet’s creator and create a special piece of art. Saturday, December 22nd from 1:00 pm- 4:00 pm and Sunday, December 23rd from 2:00 pm – 5:00 pm. FREE. National Gallery of Art, Eight and F Streets, NW. For more information call 202-633-1000. An Enchanted Christmas – Sing-A-Long: Choral Art Society of Washington will perform beloved Christmas carols and favorite sing-a-longs. Monday, December 24th at 1:00 pm. $15-$70. Kennedy Center Concert Hall, 2700 F Street, NW. For more information call 202-467-4600. The Building Zone: Children learn about the building trade through play. Recommended for children 2 years old – 6 years old. 10:00 am – 4:00 pm Mondays – Saturdays and 11:00 am – 4:00 pm on Sundays. Closed Christmas Day. $3. National Building Museum, 401 F Street, NW. For more information call 202-272-2448. And remember the U.S Botanic Garden with their wonderful train exhibit will be open on Christmas Day. 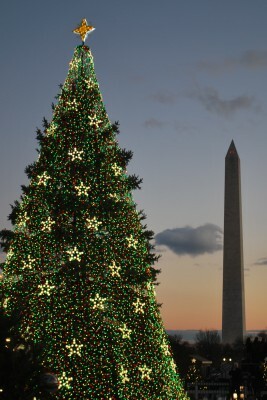 Have fun with your family and friends in Washington, DC during the holidays. I would like to thank the Washington Post and their Local Living section for helping me stay in the know! 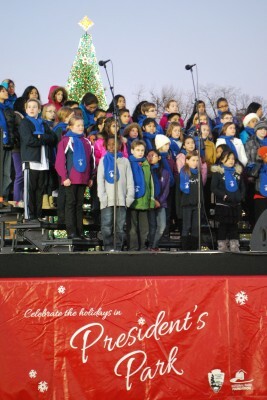 The Kids Will Travel family headed to the White House this past week to check out the festivities outside. 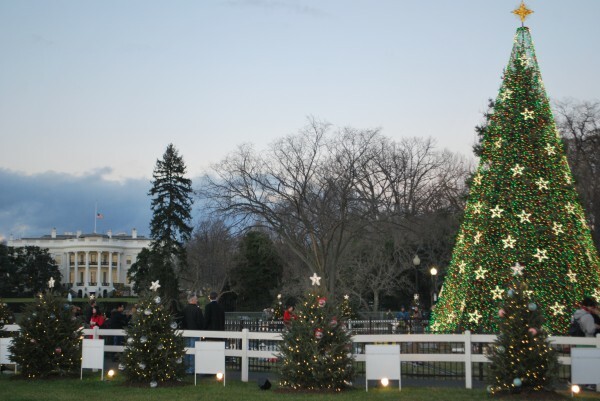 Even if you aren’t able to get tickets to tour the White House during the holidays it is definitely worth a visit at twilight to snap a few pictures from the outside and to see the National Christmas Tree. On the South Lawn of the White House (closest to Constitution Avenue and 15th Street, NW) you will find President’s Park. 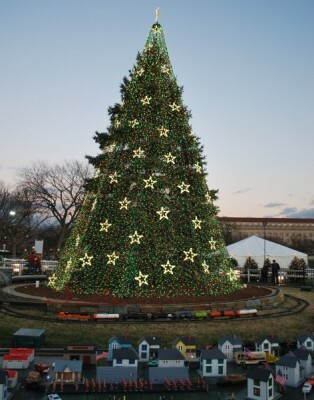 This month the park transforms into a little winter wonderland complete with a giant Christmas tree surrounded by model trains and 56 smaller Christmas trees representing the states and territories and decorated with ornaments made by children from that state. My favorite state tree this year was from Florida. The bright oranges were fabulous. When we visited earlier this week at 4:30 pm we were the only people in line – score! And he is a great looking Santa. Finally, each week day starting at 5:00 pm and weekends starting at 1:00 pm there is live music from various local singing groups. Click here for a schedule of performers. The day we visited we heard a group of 5th graders from a local school. Listening to those sweet voices was just what my heart needed. As always, the best way to reach President’s Park is by metro. Metro Center and McPherson Square are the closest metro stops. Click here for tips on traveling by metro in DC. And if you are looking for a restaurant near by try Old Ebbitt Grill, or Potbelly. Click here for more of our favorite kid friendly restaurants in the area. If you are visiting DC over the holidays or live here and are entertaining guests I hope my blog posts over the last few weeks have been helpful. Be sure to get out in the city and take advantage of the great activities going on this month. And don’t forget to follow us on twitter in order to get the latest information on current events in DC. ICE is back at National Harbor this year and after putting it off for the last several years (too cold, too crowded, I worried) we went on Monday and the kids loved it. What is ICE you ask? ICE is an exhibit sponsored by the Gaylord National Hotel at National Harbor and is a walk through exhibit made completely of ice. This year’s theme is Shrek the Halls and all your favorite characters from the Shrek movies make an appearance. The exhibit is housed in a temporary “tent” across the street from the Gaylord National Hotel and it is cold in there, 9 degrees to be exact. Make sure to bring a hat and gloves. You will be provided with a calf-length jacket to put on over your jacket, but your hands and ears get the coldest. Our daughter is 6 and was not bothered by the cold at all. I had waited to go thinking it might not be worth it when she was younger, but honestly the kids are so excited and the exhibit isn’t that big so you can go through it relatively quickly. Younger kids would definitely enjoy it too. 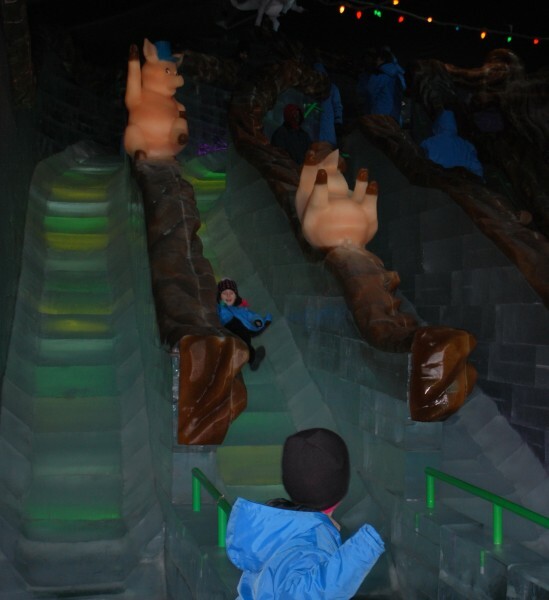 You will walk through several rooms depicting scenes from the Skrek movies, but the best room is the ice slide, which is fun for all ages. I don’t know if the kids had more fun going down themselves or watching the moms go down! 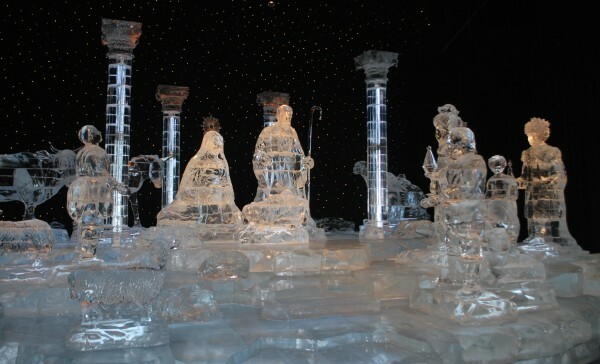 As you leave there is a beautiful and simple nativity scene made of ice. This may have been my favorite part of the exhibit. 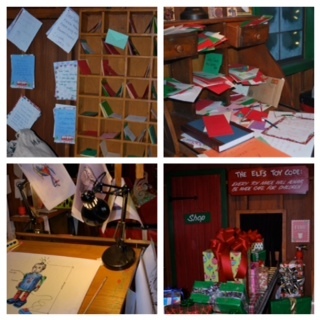 We didn’t linger for long though as our noses were frozen and the warmth of the gift shop was beckoning! It was obvious this is a popular place that is prepared for big crowds. There were lots of rope lines to weave people through to the exhibit and an enormous theater where you watch a short movie about the making of the exhibit. Luckily we went on a Monday and there was NO ONE there. It was awesome. We didn’t have to wait in line at all and the kids were able to go down the ice slides a dozen times with no wait. My advice is to skip the weekend if you can and instead go during the week. The friends we were with had gone on a Friday last year and said the $15 per ticket upgrade to VIP was worth every penny. With this ticket you skip the long line to get in, are ushered straight into the exhibit and you get a hot chocolate at the end. After we went through the exhibit we took the kids down to the harbor to look at the Christmas tree and then had a quick dinner at Rosa Mexicano. There are lots of kid friendly restaurants to choose from in the area. Click here for a complete list. Our final stop was back at the Gaylord National Hotel where we watched the nightly lighting of the Christmas Tree at 6:30 pm in their atrium. It is quite a spectacle with a light show, dancing fountains and indoor “snow.” p.s. 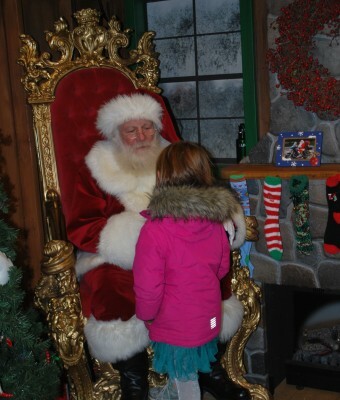 Santa was also there with no line for pictures. May be a better option than the mall! We were back in the city by 7:30 pm and the kids were tucked in bed at their normal 8:00 pm bedtime. No crowds and a margarita at dinner means it was a Monday treat for everyone! Click here for more information about ICE. The website has great background information on how the exhibit is made and you can also buy tickets online. Adults are $30 and children are $23. National Harbor is not metro accessible. The hotel does provide a shuttle that runs throughout the day from Union Station and the Old Post Office Pavilion to the Gaylord National. Tickets are $20 for a roundtrip for adults and $10 for a roundtrip for kids. Click here for a schedule of shuttle times. This is certainly an option if you don’t have a car while you’re in DC. If you do have a car it’s an easy 30 minute drive from the city. Click here for directions. 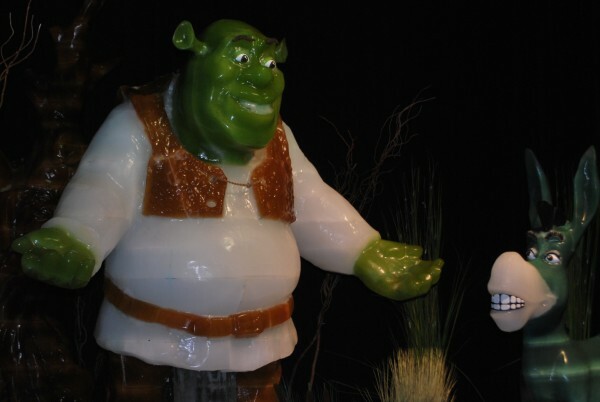 ICE and Shrek the Halls runs through January 6, 2013. 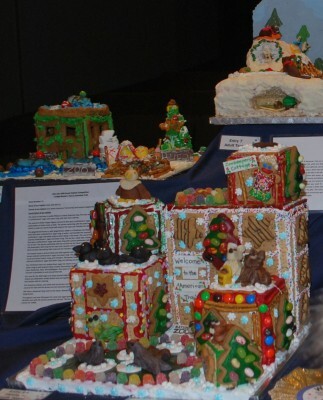 What do you want to see in DC over the holidays? Kids love sparkly lights – and who are we kidding grown-ups do too. 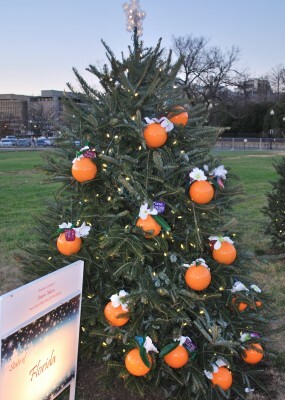 This time of year there are lots of spots to choose from to take in the festive holiday light displays. These are a few of our favorites. Start your visit at the the visitor’s center closest to the main zoo entrance on Connecticut Avenue. 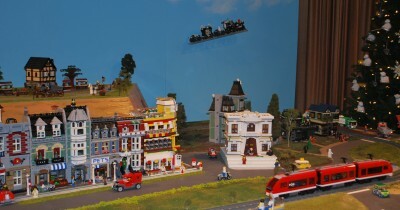 Here you will see the model train displays made of lego and the gingerbread zooscape competition. You can also pick up a cup of hot chocolate (or a glass of wine!) 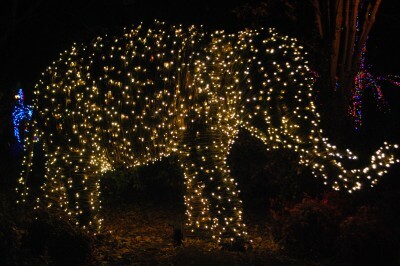 to enjoy as you stroll through the lights at the zoo. There are lights throughout the main walk-ways of the zoo and although the outside habitats are closed, the zoo houses featuring the small mammals and apes, etc. are open. Walking through the lights was great, but my daughter declared the best part of the night the ride on the new carousel and I have to admit it is a very special carousel. Be sure to walk down the hill from the main entrance towards the tigers and take a spin before you leave. Down at the same end of the zoo as the carousel is a zoo-tubing track (think burlap sack slide at the fair) and a toy train kids can ride on. 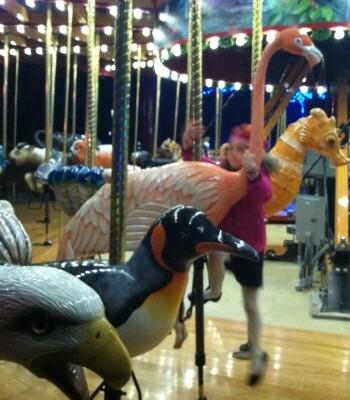 The carousel, tubing and train are all $3.00 a ride. Getting There: 3001 Connecticut Avenue NW. The closest metro stops are the Woodley Park or Cleveland Park Metro Stop, both on the red line. Parking is available for $9.00 for zoo members and $16.00 for non-zoo members. 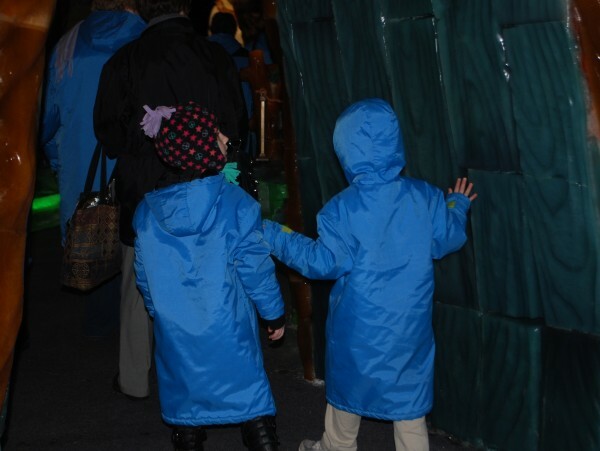 Hours and Tickets: The Zoo Lights will be on from 5pm – 9pm on December 7-9, 14-23, 26-30 and on January 1. There are no tickets necessary as it is free. Extra activities such as the carousel, tubing or train are $3.00 per ride. Enjoy the lights as you walk through the gardens and the indoor conservatory each evening from 5:30 pm – 8:30 pm. There are musical performances each evening from 6:30 pm – 8:00 pm in the visitor’s center and if you arrive early be sure to visit the free train display which is open from 10:00 am – 5:00 pm. Although this is a walking exhibit, ticket prices are charged per car. Monday – Thursday each car is $20 and Friday – Sunday each car is $25. The gardens are open from 5:30 pm – 9:00 pm Sunday – Thursday and 5:30 pm – 10:00 pm Friday – Saturday. This spot is not metro accessible. Want to stay in your car and let the kiddies enjoy the lights in their pj’s while listening to Christmas music on the radio? Try one of these area spots. The Winter Festival of Lights runs through January 1st from 5:30 pm – 9:00 pm at the Watkins Regional Park in Upper Marlboro. $5 per car. Lights on the Bay also runs through January 1st from 5:00 pm – 10:00 pm at the Sandy Point State Park in Annapolis. $14 per car. 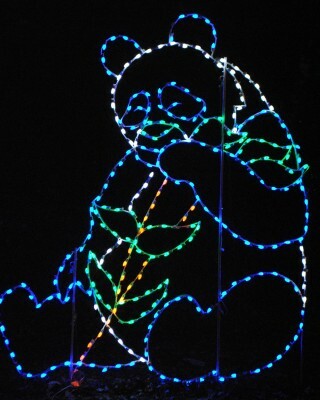 Winter Lights Festival runs through December 31st from 6:00 pm- 10:00 pm at the Seneca Creek State Park in Gaithersburg. Visit their website to get detailed information on days and hours of operation. $12-$15 per car. No matter where you decide to go, I hope these tips will help you put a little sparkle in your December.